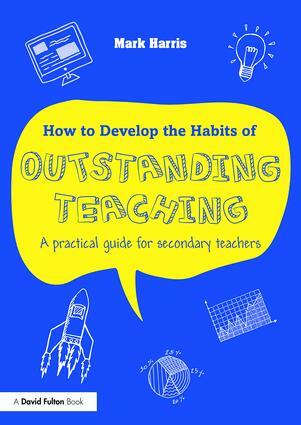 How to develop the habits of outstanding teaching: A guide to coach yourself to outstanding and develop the habits to allow you to perform consistently at the highest level. Lesson planning: Minimal time, maximum impact. A self-help guide to planning outstanding lessons. This includes questions that will stimulate you to consider all aspects of the lesson. Starters: Ideas that will ‘hook’ the student, create curiosity, link up students’ thinking and provide an opportunity to action feedback and bind today’s lesson to the big picture. Success criteria: The pursuit of excellence: How to construct differentiated criteria so ALL students can excel, moving from mediocrity to excellence. Practice makes progress: How to build resilience and G.R.I.T. : Strategies to engage all students and keep them going even when it gets tough. Differentiation: How to offer appropriate challenge to all students and how to scaffold success. Questioning: Ideas and dialogue to get all students involved in your lesson and get KILLER answers. Modelling: Supporting and scaffolding so all students achieve above and beyond. Moving away from modelling: How to create independence: How to take away the support and create 21st-century learners. Literacy for learning: How to help your students speak, write and read like an expert in your subject. Classroom management: Habits and strategies to win over the toughest students and classes. Marking for progress: A simple guide and examples of excellent marking that support students in progressing and achieving their targets, including techniques to get students to improve their own work. How to get students to remember what you teach them: A look at how we remember and strategies to help our students recall, consolidate and apply what we teach them. How to create a culture of creativity and curiosity: Ideas and strategies to employ within the classroom that will enthuse and inspire. Homework: A fresh look at homework tasks and how we can make them differentiated, independent and challenging. Time management: Habits and hacks to help you become more efficient in the workplace.